We’d love your help. 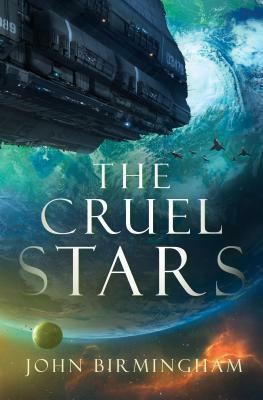 Let us know what’s wrong with this preview of The Cruel Stars by John Birmingham. With a ruthless sect of humanity intent on wiping out their species, five intrepid heroes must think like their enemies in this epic sci-fi adventure for fans of The Expanse and Battlestar Galactica. The galaxy was once terrorized by the Sturm, a group of "species purists" intent on destroying any human with genetic or cybernetic enhancements. Fashioning themselves as the o With a ruthless sect of humanity intent on wiping out their species, five intrepid heroes must think like their enemies in this epic sci-fi adventure for fans of The Expanse and Battlestar Galactica. The galaxy was once terrorized by the Sturm, a group of "species purists" intent on destroying any human with genetic or cybernetic enhancements. Fashioning themselves as the one true "Human Republic," the Sturm cut a bloody swath across the stars, killing billions before finally being defeated and driven into the far reaches of Dark Space. Centuries of peace bred complacency. Everyone believed the Sturm had died out in the Dark. They were wrong. The enemy has returned and, with a brutal and decisive attack, knocks out almost all of humanity's defenses. Now on the brink of annihilation, humankind's only hope is a few brave souls who survived the initial attack: Commander Lucinda Hardy, thrust into uncertain command of the Royal Armadalen Navy's only surviving warship. Booker3, a soldier of Earth, sentenced to die for treason, whose time on death row is cut short when the Sturm attack his prison compound. Princess Alessia, a young royal of the Montanblanc Corporation, forced to flee when her home planet is overrun and her entire family executed. Sephina L'trel, the leader of an outlaw band who must call on all of her criminal skills to resist the invasion. And, finally, Admiral Frazer McLennan, the infamous hero of the first war with the Sturm hundreds of years ago, who hopes to rout his old foes once and for all--or die trying. To ask other readers questions about The Cruel Stars, please sign up. I got this one at the Del Rey book booth at ECCC. I really enjoyed this one. So a brief plot synopsis: a number of different characters (a princess, a member of the military with a complicated past, a war hero, a criminal) are all caught up in a plot by a group of exiled humans (the Sturm) who are determined to destroy humanity. What I liked: fast paced plot, great writing, interesting world (it feels unique enough from ours to be cool, but not so weird that I couldn't follow it), compelling villa I got this one at the Del Rey book booth at ECCC. I really enjoyed this one. What I liked: fast paced plot, great writing, interesting world (it feels unique enough from ours to be cool, but not so weird that I couldn't follow it), compelling villains with an interesting back story. What I didn't like: there were so many main characters that it was hard to really get involved with any of them at times (and one or two I just couldn't bring myself to care about). It felt more like a prequel to the big fight between the two factions, in certain ways, than a story in and of itself. Got this book at Emerald City Comicon from the Del Ray Booth. Its an advanced readers copy but even so I thought it was really good! I'm not usually into scifi all that much but I found this one rather thrilling to read. Definitely would recommend when it comes out! John Birmingham grew up in Ipswich, Queensland and was educated at St Edmunds Christian Brother's College in Ipswich and the University of Queensland in Brisbane. His only stint of full time employment was as a researcher at the Defence Department. After this he returned to Queensland to study law but he did not complete his legal studies, choosing instead to pursue a career as a writer. He curren John Birmingham grew up in Ipswich, Queensland and was educated at St Edmunds Christian Brother's College in Ipswich and the University of Queensland in Brisbane. His only stint of full time employment was as a researcher at the Defence Department. After this he returned to Queensland to study law but he did not complete his legal studies, choosing instead to pursue a career as a writer. He currently lives in Brisbane. While a law student he was one of the last people arrested under the state's Anti Street March legislation. Birmingham was convicted of displaying a sheet of paper with the words 'Free Speech' written on it in very small type. The local newspaper carried a photograph of him being frogmarched off to a waiting police paddy wagon.